It was a scene that seemed all too familiar: on Sunday, October 3rd, Andrew Zaccardo of the Laval Patriots Midget AA hockey team was hit from behind by an opposing team member at the Martin Brodeur arena. Just under a year ago, Zaccardo was playing on a Lac St. Louis Tigers midget espoirs team and one of his teammates, Marc-Andre Emond, suffered a similar injury when a hit from behind sent him crashing into the boards. Zaccardo suffered a broken rib and a fracture of the C-5 and C-6 vertebrae after he was hit from behind. He underwent surgery on October 4th and, while the operation was deemed a success, Zaccardo still can't move his lower limbs. The Montreal Children’s Hospital Trauma program, along with many other hockey experts and well-respected officials warn that in order to prevent such devastating injuries, players must never hit anyone from behind. 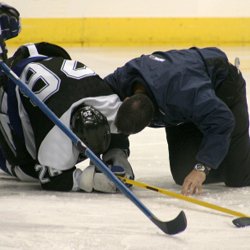 The well-being and safety of all amateur hockey payers is of primary importance. This includes, among other things, a shared responsibility with parents and guardians to nurture the physical and emotional well-being and safety of its participants.